The Cope Company Salt, Lancaster, donated $3000 to Masonic Village, Elizabethtown. 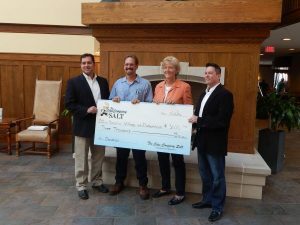 Lancaster, PA – The Cope Company Salt, Lancaster, donated $2000 to The Humane League of Lancaster County. The Human League is best known for their animal adoption centers and non-profit veterinary hospitals. Cope Salt wants to help the Humane League continue their work of saving animals and helping people be the best caretakers they can be.